English referee sets record for bookings but shows only one red in Holland-Spain World Cup final marred by fouling. This was not how it was supposed to happen. 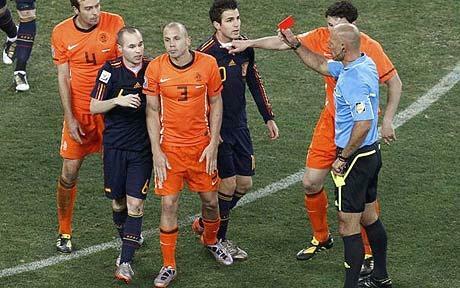 When Howard Webb blew the whistle at the end of extra time he was hounded by a pack of Dutch players, Mark van Bommel to the fore. When he went to collect his post-match medal he was loudly whistled. It was an ending fitting what had gone before. This had been a horrible match to referee: the dirtiest final in the history of the World Cup. The record for most bookings in a World Cup final was the six that had been shown in 1986. Webb had produced five by half-time, nine by the end of normal time. By the end of extra time it was up to an astonishing 14. That is a record that will take some breaking. That there was only one dismissal was incredible: he sent off John Heitinga for his second bookable offence in extra time (for pulling back Andrés Iniesta). It was hard to dispute any of those bookings. What was baffling was that it took him nearly 110 minutes to produce the red card. Webb got some of the big calls wrong. He should have sent off Nigel de Jong for brutally planting his studs in Xabi Alonso’s chest in the first half. If Webb had been on duty with the South Yorkshire police he’d have arrested him — it wasn’t a challenge, it was assault. Carles Puyol, booked for an early foul on Arjen Robben, should have gone for trying to pull back the same player during the second half. While Xavi might also have been awarded a penalty when Heitinga got his leg in the way as the Barcelona midfielder tried to shoot, Webb’s decision to award Iniesta’s goal was sound. The Dutch felt it was offside but while Iniesta had been offside earlier in the move, he had come back on to receive Cesc Fabregas’s pass. The players made this an extremely hard game for Webb, though. The cynicism of some of the Dutch was depressing, as they sought any means to stop the Spanish playing their game. Van Bommel embodied this attitude. He fouled Iniesta brutally in the first half, was rightly booked and tempted Webb several times to produce that second yellow. In the end it was Heitinga, more hapless than harmful, who had to trudge off. Before kick-off there was footage of world leaders and celebrities arriving at the vvip entrance (Fifa’s absurd abbreviation). Sandwiched between shots of Naomi Campbell, Morgan Freeman and the ever oleaginous Sepp Blatter arriving at Soccer City was footage of a bald Yorkshire miner’s son dragging his kitbag up the red carpet. He was all smiles — nobody could have expected what was to come. If the scale of Soccer City, with its 85,000 capacity, did not impart the enormity of the event he was about to take responsibility for then the thought that this game was expected, on some people’s estimates, to attract a television audience of three billion (the world population is just shy of seven billion) would have done it. This was a long way from the Rotherham and District Sunday league. As Webb, flanked by his trusted assistants Darren Cann and Mike Mullarkey, took his position in the tunnel you felt nervous for him. Not only did he have to deal with the thumping heartbeat pounding out of the sound system, ramping up the tension, but his pre-match concentration was unexpectedly disrupted when he had to clear a space between the waiting players for an unconscious pitch invader — summarily dispatched by a punch from a security officer — to be carried down the tunnel. It took only 15 minutes for the first booking, Robin van Persie being cautioned for a reckless slide in on Joan Capdevila, his second bad foul in the opening exchanges. From that moment on Webb had to keep reaching for that yellow card. Puyol went in studs first on Robben’s ankle; De Jong kicked Alonso; Van Bommel smashed into Iniesta; Sergio Ramos upended Dirk Kuyt. That was all before half-time. Van Bommel, waging his destructive war, even found time to trip up Webb himself. After the break the Dutch moved clear of the Spanish in the booking stakes. Heitinga, the normally mild-mannered Gio van Bronckhorst and Robben all saw yellow. For Spain, Capdevila was booked. That made it one booking every 10 minutes of normal time. With nerves fraying in extra time, there was no let up. Gregory van der Wiel was next in the book before Heitinga finally became the first player to walk. Joris Mathijsen was booked for his furious dispute of the Spanish goal. Even the benign pair of Iniesta and Xavi joined the club. What a mess.